Fellows have the opportunity to work on research projects that may lead to publications or presentations. They have access to the computerized clinical database and radiographic archives of Anderson Clinic hip and knee replacement patients. The hip and knee databases along with the radiographic archives are unsurpassed in total joint arthroplasty in terms of volume of patients, the longevity, and completeness of patient follow up. AORI has the largest collection of revised failed hip and knee implants along with the largest collection of post mortem implants in the world, which allows unprecedented studies of how older implants performed and how they failed. The Fellows are supported by AORI’s research laboratory, engineering and statistical staff, photographic capabilities and library services provided by INOVA Fairfax. 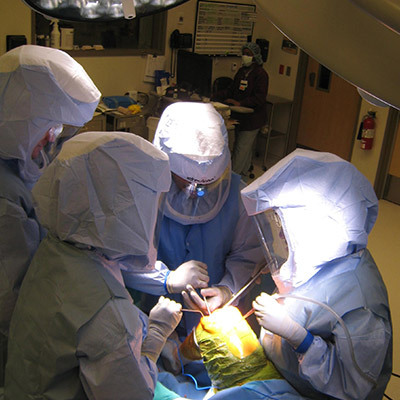 Anderson Orthopaedic Research Institute’s clinical and scientific investigators: Dr. Rick: Purcell, Nancy Parks, Jeanine Gargiulo and Dr. Bill Hamilton, reported that obese patients with a Body Mass Index of greater than 35, (≥35kg/m2), are at a substantially increased risk for a postoperative infection warranting revision surgery when the anterior surgical approach is used. This is likely due to the deep abdominal folds overlaying the incision. The investigators suggest comparative studies should be done using other surgical approaches with obese individuals to determine if the infections were primarily due to the approach or if significant increase in body mass increases overall risk of infections in hip patients. Research Summaries Written and Compiled by, Renée Burkett, Writer. © Copyright AORI 2016. All Rights Reserved.